Take the first step in automating your manufacturing business. We can help make it happen. Scroll down to learn more. Cobots are making automation easier than ever before for small and medium sized businesses. Cobots provide access to all the benefits of advanced robotic automation, with none of the extra costs associated with traditional robotic installations. Learn how we can help. What does Robot 27 do? Robot27 is your automation team. We’re your robotic concierge. We provide on-site evaluation and develop the right solution for your business – from selecting the correct cobot for your tasks to all programming, installation, training, and customer support. Your success is our mission. 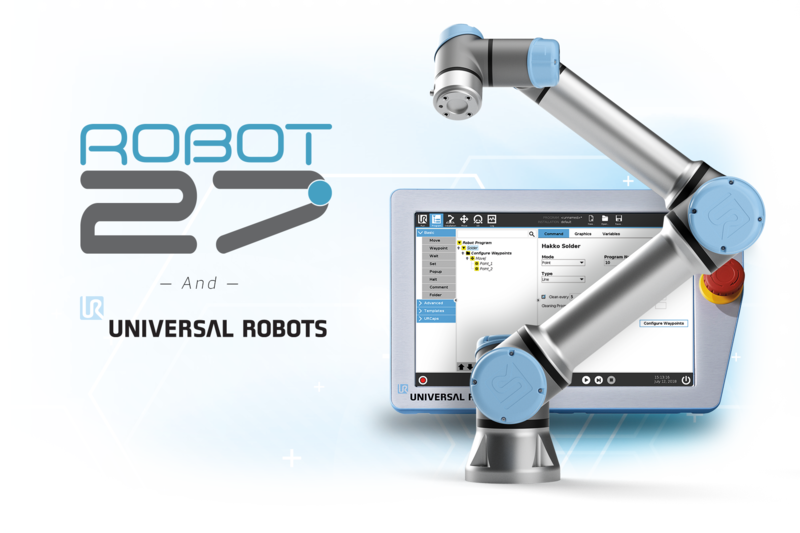 Universal Robots believes that collaborative robot technology should be available to all businesses. Investment is quickly recovered as robotic arms have an average payback period of just six months. They’re dedicated to bringing flexible and easy-to-use robots to businesses. We can help your business automate.